We recently presented Rhys with our Golden Caster award. 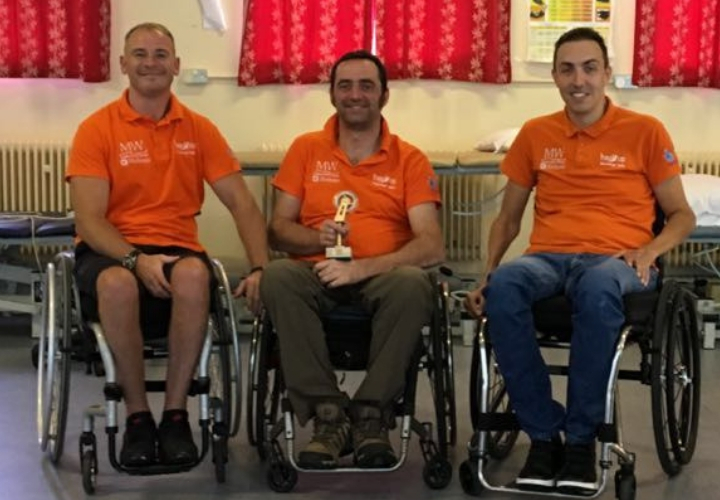 He earned this recognition through volunteering as a wheelchair skills trainer and running sessions at every spinal centre in the UK. This is a significant feat, considering that there are 11 centres across England, Wales, Scotland and Northern Ireland! Rhys sustained his injury in December 2000 after attempting a jump on his mountain bike. 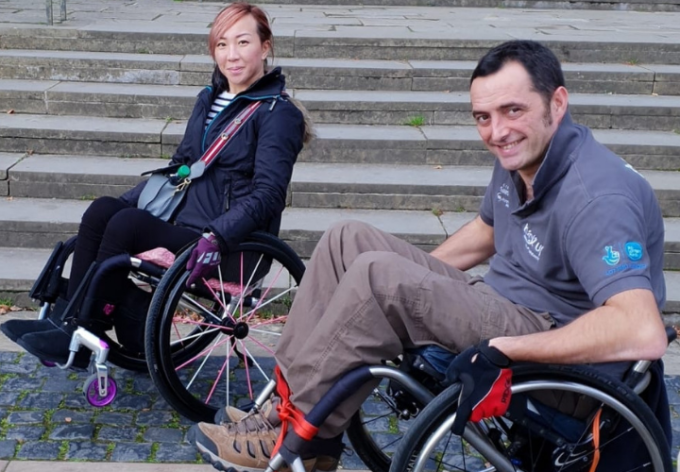 He met Back Up when he was newly injured at the Inter Spinal Unit Games – an event which introduces people with a spinal cord injury to adapted sports. Rhys continued to follow what Back Up was doing, and he soon came across an opportunity that would begin his journey towards becoming one of our most dedicated volunteers. Rhys has been working with us regularly since then, kindly donating his time and effort and getting “a hell of a lot” out of volunteering in turn. His favourite part of being a volunteer is seeing how people’s confidence as wheelchair users can bloom over just a week on one of our courses. It fills him with a great sense of pride and achievement. Rhys is particularly interested in tailoring wheelchair skills to suit the needs of course participants. He works with them to find creative solutions for tackling obstacles like kerbs and uneven pavements. Rhys admits that it was a very happy moment in his volunteering career when he was presented with the Golden Caster. We are incredibly thankful for the time Rhys and all of our fantastic volunteers give us to Back Up, and we’re thrilled that they get so much out of volunteering. If you are interested in becoming a volunteer wheelchair skills trainer, you can find out more on our website or email our team. You can also find out all the other ways you can get involved as a volunteer.